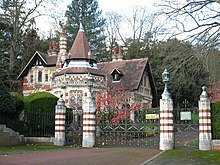 The entrance and gatehouse at Harrison's Friar Park estate. 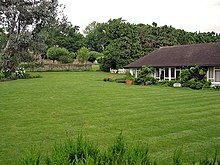 In December 1999, he and his wife Olivia were the victims of a knife attack by an intruder. 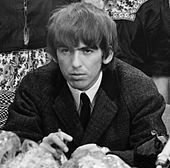 In May 2001, it was revealed that Harrison had undergone an operation to remove a cancerous growth from one of his lungs, and in July, it was reported that he was being treated for a brain tumour at a clinic in Switzerland. While in Switzerland, Starr visited him but had to cut short his stay in order to travel to Boston, where his daughter was undergoing emergency brain surgery, prompting Harrison to quip: "Do you want me to come with you?" In November 2001, he began radiotherapy at Staten Island University Hospital in New York City for non-small cell lung cancer that had spread to his brain. When the news was made public, Harrison bemoaned his physician's breach of privacy, and his estate later claimed damages. [nb 15] On 12 November in New York, Harrison, Starr and McCartney came together for the last time. Before his religious conversion, Cliff Richard had been the only British performer known for similar activities; Richard's conversion to Christianity in 1966 had gone largely unnoticed by the public. 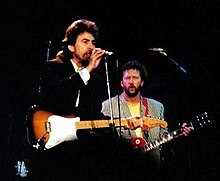 "By contrast," wrote Inglis, "Harrison's spiritual journey was seen as a serious and important development that reflected popular music's increasing maturity ... what he, and the Beatles, had managed to overturn was the paternalistic assumption that popular musicians had no role other than to stand on stage and sing their hit songs." 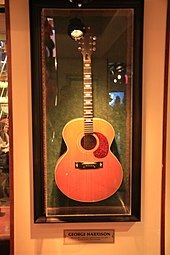 ^ Harrison had formed a close friendship with Clapton in the late 1960s; he wrote one of his compositions for the Abbey Road album, "Here Comes the Sun", in Clapton's back garden, and he played guitar on Cream's song "Badge", which he co-wrote with Clapton. ^ "Beatles Ireland – George Harrison Irish Heritage". Beatlesireland.info. Retrieved 28 May 2018. ^ "The Beatles Browser: Part Four – Bill Harry – Mersey Beat". Triumphpc.com. 12 August 1964. Retrieved 28 May 2018. Bronson, Fred (1992). Weiler, Fred (ed.). The Billboard Book of Number One Hits (3rd revised ed.). Billboard Books. ISBN 978-0-8230-8298-8. Dawtrey, Adam (2002). "Adventures on Screen". In Fine, Jason (ed.). Harrison: By the Editors of Rolling Stone. Simon & Schuster. ISBN 978-0-7432-3581-5. Fricke, David (2002). "The Stories Behind the Songs". In Fine, Jason (ed.). Harrison: By the Editors of Rolling Stone. Simon & Schuster. ISBN 978-0-7432-3581-5. Frontani, Michael (2009). "The Solo Years". In Womack, Kenneth (ed.). The Cambridge Companion to the Beatles. Cambridge Companions to Music. Cambridge, UK: Cambridge University Press. ISBN 978-1-1398-2806-2. Gilmore, Mikal (2002). "The Mystery Inside George". In Fine, Jason (ed.). Harrison: By the Editors of Rolling Stone. Simon & Schuster. ISBN 978-0-7432-3581-5. Keltner, Jim (2002). "Remembering George". In Fine, Jason (ed.). Harrison: By the Editors of Rolling Stone. Simon & Schuster. ISBN 978-0-7432-3581-5. Kot, Greg (2002). "Other Recordings". In Fine, Jason (ed.). Harrison: By the Editors of Rolling Stone. Simon & Schuster. ISBN 978-0-7432-3581-5. Petty, Tom (8 December 2011). Wenner, Jann (ed.). "Rolling Stone: The 100 Greatest Guitarists of All Time: George Harrison". Rolling Stone (1145). Rosen, Craig (1996). Lukas, Paul (ed.). The Billboard Book of Number One Albums. Billboard. ISBN 978-0-8230-7586-7. Sheff, David (1981). Golson, G. Barry (ed.). All We Are Saying: The Last Major Interview with John Lennon and Yoko Ono (2000 ed.). St Martin's Griffin. ISBN 978-0-312-25464-3. Womack, Kenneth (2006) . "Ten Great Beatles Moments". In Skinner Sawyers, June (ed.). Read the Beatles: Classic and New Writings on the Beatles, Their Legacy, and Why They Still Matter. Penguin Books. ISBN 978-0-14-303732-3.